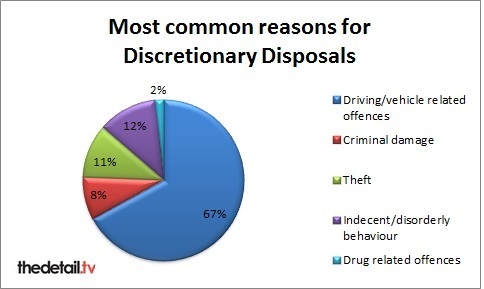 While the majority of the disposals issued between March 2010 and November 2012 have been for “minor” driving offences, such as operating a vehicle while using a mobile phone, the figures also raise questions about how and why the policy has been used for more serious crimes. The figures obtained by The Detail show that two discretionary disposals issued for sexual assault committed by two 11-year -old offenders and a third by a 28-year-old. The PSNI says these offences, on the whole, relate to street urination or ‘mooning’ offences, many of which involved younger offenders. The data also contains 335 cases of aggravated assaults on a female or boy under 14 years of age, five common assaults on a child or young person, 122 assaults on police, 241 assaults occasioning actual bodily harm and 1,416 common assaults (86 indictable). The PSNI said the assault cases refer to behaviour which technically constituted an indecency offence but which was essentially “some hi-jinx between friends which went too far.” Similarly they say an Assault Occasioning Actual Bodily Harm can be as low level as a common assault with sign of injury – for instance a graze or a bruise. There were also disposals for a robbery offence by a 17-year-old and 103 cases of fraud by false representation or abuse of position. 18 for threats to kill, seven of these were for people aged 18 and under. There were 1,366 cases of disorderly behaviour, 388 between ages 10 – 18. Two cases were for causing death or bodily injury by careless driving (without due care and attention). 200 disposals were for failing to remain where an accident caused damage; nine for failing to remain where an accident caused injury; 22 for failing to stop for police; 444 for not having vehicle test certificate and three concerned a pedestrian on a motorway. One 15-year-old was handed a disposal for voyeurism, while a 98-year-old was given a disposal for using a mobile phone while driving. One case was an offender aged 50 for kerb-crawling from a vehicle. Forty-six offences were for possession of an offensive weapon in public; a 17-year-old received a discretion for possession of a prohibited firearm (a gun), three offenders were aged 18 and under and concerned possession of an offensive weapon with an intent to commit an indictable offence. -	Green Zone (Consultation not required): outlines minor offences by which officers can use a discretionary disposal without consultation for minor offences e.g minor motoring offences and road traffic accidents or public order offences that are not racist or sectarian. -	Amber Zone (Authorisation by supervisor): Offences against juveniles under 18 years, history of offending one or more previous diversions, alleged possessions of small quantities of drugs. 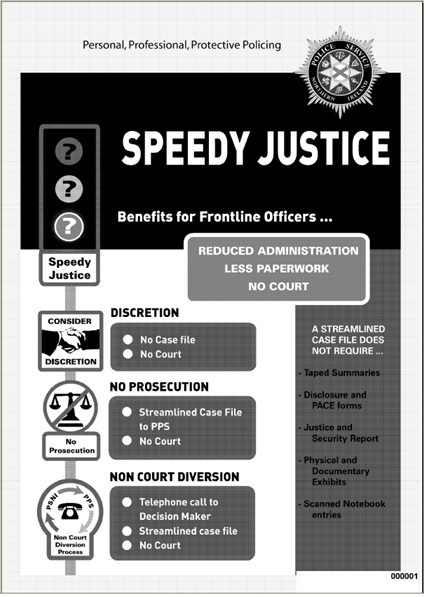 -	Red Zone (No options): Outlines offences where the vast majority of speedy justice options should never be available, the list contains serious crimes such as homicide, terrorism, robbery, serious fraud, drug offences with intent to supply, child protection and vulnerable adult offences. Chief Inspector Michael Kirby said: "I recognise that the data flags up what seems to be some serious offences that the policy is being used for and as our default position we wouldn’t normally use it for these types of crime. But equally in each case we would look at the individual offence and set of circumstances.